Home Parker Community Technologies Electromechanical Group Electromechanical Knowledge Base What tips are there for using PDB for communications with an AC10? An RS485 converter is required to facilitate serial communications to an AC10. 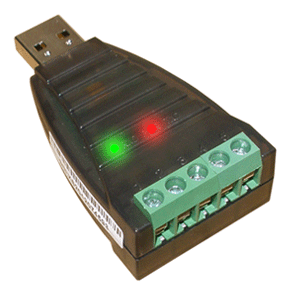 We recommend the US Converters USB-RS478 Converter part number XS885. It is available from www.usconverters.com. Using a twisted pair cable, connect pin 1 (T/R+) to the A terminal and pin 2 (T/R-) to the B terminal. Set up the communications in PDB by clicking on the Protocol icon. 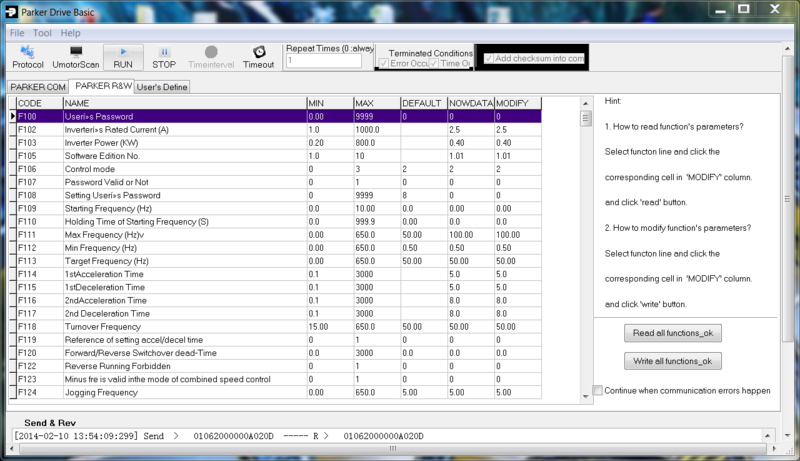 Set the communication parameters as shown. The communication settings must match those set in the AC10 parameters F900-F904. When selecting the COM make sure the window displays COMx and not just a number without the word COM. If the correct COM port number is not in the pull down list, just enter it on the main window as shown here. F900 = Inverter Address, range 1-255. Recommended setting is 1. F901 = Modbus Mode. 1 = ASCII mode, 2 = RTU mode. Set to 2. F903 = Parity Check. 0 = No check, 1 = Odd parity, 2 = Even parity. Set to 0. F904 = Baud Rate. 9600 = 3, 57600 = 6. Set to 3. Select the Timeout window and enter 100. 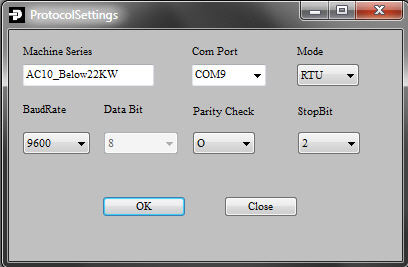 You can modify and monitor parameters by clicking on the Parker R&W tab. 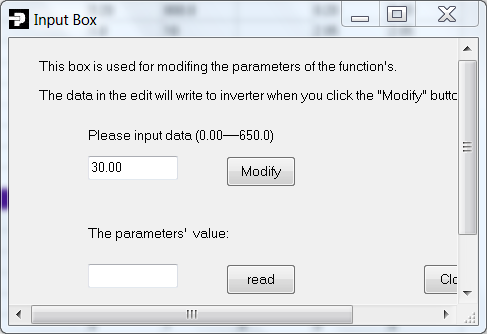 To modify a parameter, click on the Modify tab. A dialogue box will open as shown in the next picture. You can read the current value of the parameter by click on the read button. To change a value simply enter the value into the top text box and click Modify. Note: To make the changes in PDB permanent, you must set F219 to 0 first via the MMI keypad, then exit from this menu, then make your changes. Then set F219 back to 1 via the MMI keypad after the changes were made. Note: If you are communicating over Modbus write 3 to Register 0x2001 first to save the changes. Then make your changes or modifications. Then write 4 to Register 0x2001. Click on the Parker R&W tab. Check the box Continue when communications errors happen. Click on the Read all Functions_ok button. Once PDB has finished reading all the parameters click on File and Export Functions or press Ctrl and E. Name the configuration file. It has to be limited to 8 characters in length and the extension has to have an extension ".DBF". 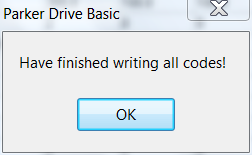 If there is an existing file present with the same delete the file first, as the file will not get over written. Also check the date and the time on the file to make sure it is the correct one. Note: Ensure F219 is set to 0 in the drive (this will save the parameters on a power cycle). This MUST be done first, before the parameters are written to. Set F219 = 0 in the MMI and then make sure you exit this menu. To install the backed up parameters into a new drive click on File and Import Functions or press Control and I. Select the configuration file xxxxx.DBF, which you want to install. Ensure F219 is set to 0 in the configuration, you are installing. Click on the Write all Functions_ok button. When PDB has finished it will show the dialogue box below. Click OK to finish. In the MMI, set F219 = 1. Note: If you want to view or print the parameters on the files that were Exported, change the extension to XLS or CSV.